Hot Stone massage is a specialty massage where the therapist uses smooth, heated Basalt stones as an extension of their own hands. 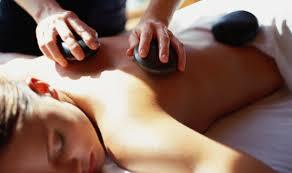 Smooth, warm stones are placed to warm the muscles and skillfully used to perform your massage. The heat can be both deeply relaxing and help warm up tight muscles, so the therapist is able to work more deeply and quickly. Our trained therapists also incorporate a customized massage with the use of hot stones, which offers enhanced benefits. The hot stones have a sedative effect that can relieve chronic pain, reduce stress and promote deep relaxation. A combination of Swedish Massage and BodyRock Therapy. Warm stones help loosen tight muscles to allow deeper work to occur. Approximately a 60-minute treatment.